Patty Contreras is a California Licensed Insurance Broker with a unique approach to helping people with integrity and love. She puts her clients’ interest first, which gives her the ability to help without expecting anyhing in return. Her winning attitude and keen approach to business solutions are her greatest assets in helping people in position assets and goals to a win-win approach. Her core principles and effective business approach are what give her the success she attains: honesty, highest quality service, integrity and caring edge for her clients. approach to retirement, estate planning & tax strategy are the cornerstones to the success of how she helps hundreds of folks throughout the Country. Her expertise in the non-profit, private, and education sector over the last 27 years give her the edge to educate clients in making sound decisions. Her extensive experience interfacing with the business community started when at the time, she assisted the State Commissioner and Chairman of the California Post-Secondary Education Commission (CPEC), which oversees the planning and coordination of the Community College, State College and UC systems. There she learned to coordinate a heavy calendar of events and to always communicate gracefully with important elected officials and industry leaders. The Commission was tasked with reporting to the President and Congress on an appropriate federal government role with regards to the Internet and other education tools for secondary and postsecondary students. In May 2006, Patty built a successful insurance agency and as a result of her determination and passion, became 1st Year Achiever, Top Rookie of the Year for one of the largest Multi-billion dollar insurance company. She continues to expand her broad list of clients in various countries in California and various States within the US. Patty graduated from UCLA in 1991 with a Bachelor’s degree in Italian Literature and a minor in French. 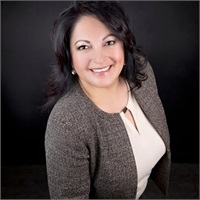 She is fluent in Spanish, Italian and French, is a member of NAIFA (National Association of Insurance & Financial Advisors), a former Rotarian and Soroptimist. She’s a member of the National Care Planning Council Huntington Beach Chamber of Commerce and Norwalk Chamber of Commerce Board of Directors. She resides in Rancho Cucamonga with her husband Jesse of 29 years and young son, Joshua (16), and “JoJo” the dog. She has a tremendous love for seniors, adolescents at risk, enjoys working out, bike riding and loves cooking, homemade meals.